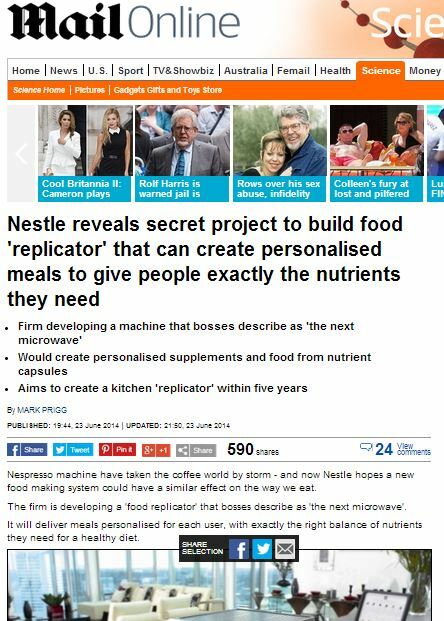 Nestlé to create machine to give people “everything they need”. They should start with clean drinking water. Nespresso machine have taken the coffee world by storm – and now Nestle hopes a new food making system could have a similar effect on the way we eat. The firm is developing a ‘food replicator’ that bosses describe as ‘the next microwave’. 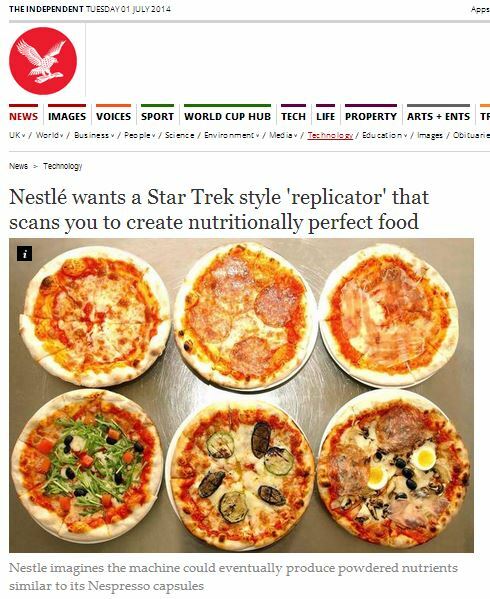 It looks like 3D printers are going to give us the best chance to ‘dial up’ a meal science fiction style -but food giant Nestlé has gone one better and said they’re also working on a machine that can figure out the nutrients our body needs as well. Bloomberg reports that the project (which has been inexplicably code-named ‘Iron Man’) would analyse an individuals’ dietary deficiencies, studying a range of factors from carbohydrates to cholesterol to produce highly personalized meals. Ah, the spirit of invention and innovation, alive and well Nestlé! Aren’t they a wonderful, forward-thinking, positive company about whom we should only have warm, fuzzy and happy thoughts – thoughts like the ones this press-release-published-as-news engender? It’s almost enough to make one forget that Nestlé are a company who’ve been the subject of a widespread public boycott for over 30 years over their aggressive promotion of baby formula in developing countries with poor access to clean drinking water. In fact, the positive-if-entirely-speculative story about something Nestlé have suggested they might look at in the future might have changed some people’s minds about the company – maybe. Yet, there’s something slightly disingenuous about Nestlé’s claims to develop a machine that would give its user ‘exactly the nutrients they need’. After all, Nestlé Chairman Peter Brabeck-Letmathe has only recently confirmed he recognises the importance of water to people, having previously argued that water is not a basic human right. While it’s impossible to say whether the story about the future, possible, one-day development of an ‘everything you need’ machine is linked to Nestlé’s recent ‘we don’t actually think everyone *needs* access to water’ position, the timing is still interesting. Is there a food-security version of greenwashing? This entry was posted in Nestlé and tagged Alex Hudson, bbc, Chairman Peter Brabeck-Letmathe, daily mail, Ed Beagle, independent, james vincent, Mark Prigg, Nestlé on July 2, 2014 by Michael Marshall.